Sydney hostage crisis: How serious is Australia's terrorism problem. 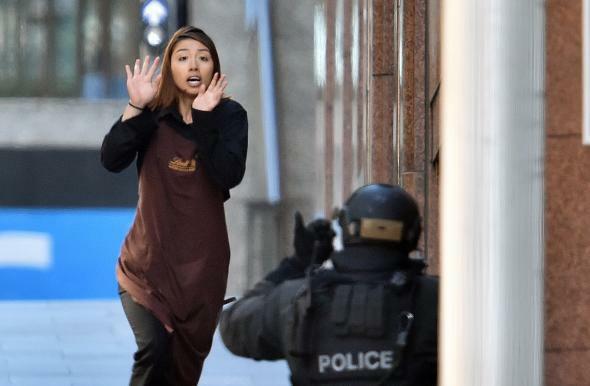 A hostage runs toward police from a café in the central business district of Sydney on Dec. 15, 2014. Police have now stormed the downtown Sydney café where a lone gunman took more than a dozen hostages. We still don’t know much about the identities or motivations of the attacker beyond the fact that he forced his hostages to display a black flag with white Arabic script resembling those used by al-Qaida and ISIS. Given the prominent role Australians have played in the ongoing conflict in Iraq and Syria, it seems reasonable to speculate that there may be a link. In June it was reported that there were 150 Australians fighting with extremist groups in Iraq and Syria, making it the largest per-capita contributor of foreign fighters. In August an Australian jihadist in Syria with a history of mental illness received international attention for posting a photo online showing his 7-year-old son holding a severed head. Australia has already seen two instances of confirmed ISIS-related violence—one attempted, one successful. In September, Mohammad Ali Baryalei, a former nightclub bouncer from Sydney who had moved to Syria to fight with the Islamic State, phoned a friend back home asking him to carry out a beheading on camera as a “demonstration.” The call was intercepted, and the friend was arrested. Several days later, an 18-year-old “known terror suspect” who had been spotted carrying the ISIS flag at a shopping center stabbed two counterterrorism officers in Melbourne before he was shot and killed. Following the latter attack, hundreds of police officers raided dozens of homes in Sydney and Brisbane, arresting 15 people in the largest counterterrorism raids in the country’s history. Allegations of police abuses during the raids lead to protests in the Muslim community. Australia has been a part of the international military coalition fighting ISIS since October, and federal police have warned the country’s citizens to stay out of the conflict. Echoing the concerns other Western governments, Australian officials have warned of radicalized fighters returning home from Syria to carry out attacks in their own country. So far, though, we haven’t seen many signs of this. The Baryalei plot, which never got very far, was an exception to the rule in that someone in Syria was in contact with a potential attacker back home. The Melbourne stabber, the two men who carried out attacks in Canada in October, and Mehdi Nemmouche, the ISIS vet who shot three people at the Jewish museum in Brussels last May, are all believed to have acted on their own with little to no coordination from ISIS central. The suspect in this case was an Iranian-born self-styled cleric and “spiritual healer” named Man Haron Monis who was apparently well-known to police for having sent offensive letters to the families of soldiers killed in Afghanistan. He was on bail for being an accessory to the murder of his ex-wife and was facing multiple sexual assault charges. Monis, who according to his website used to be Shia but converted, had no known ties to terrorist groups and seems to have acted alone. A reasonable case could be made that this describes most terrorists, but the point here is that this appears to be a solo effort and not a very well-planned one. The good news is that these lone-wolf attackers are generally much less effective that organized plots. The bad news is that they are much harder to suss out and prevent in advance.